Is Blackberry Recovering Post New CEO Arrival? Blackberry was reeling under pressure and we were worried that Blackberry may go like Nokia way which has been sold to Microsoft. We have written when things at Blackberry were not proper and Blackberry chart was showing the weak performance. However change of CEO to John Chen who appears to be quite aggressive in approach has stated that he's not averse to snuffing out the iconic handsets completely if BlackBerry phones don't start making money once again. Thus marketing strategy says that change is better than being stagnant i.e do something or get to a side and new CEO is now doing something. 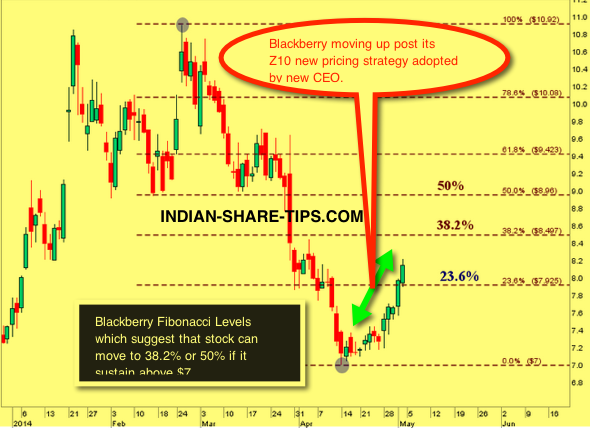 Have a look at the recent chart of Blackberry which shows that probably things may start improving as CEO John Chen strategic plan to bring down Z10 price to 17900 from its original price of 34000 is doing wonders in India as stock has become out of stock and getting lot of media publicity. The Z10 is an excellent phone within the same segment and has got raving reviews from CNBC tech guru. If you have been looking to get a value for money phone then go for it as we have gifted these phones to our complete staff and research team as we are proud of their accomplishment in form of providing the best intraday tip which performs irrespective of the condition in the market. Have a look at below Z10 video from CNBC Tech Guru which will clear all your doubts.